Seven years after the incident took place, an officer in the elite Metzada unit of the Israel Prison Service admits that his subordinates threw stones at soldiers in Bil’in – as part of their mission. However, as the demonstration progressed towards the construction site of the fence, several young men of Arab appearance, unknown to organizers and thought to have come from neighboring villages, started throwing stones, giving the soldiers the queue they needed to disperse the demonstration with tear gas and make arrests. According to several witnesses, leaders in the popular struggle approached the young men and asked them to stop throwing stones – at which point the strangers pulled out concealed guns and handcuffs and arrested the people who asked them to stop. It would later be made known that these were combatants in the IPS elite anti-riot unit Metzada (“Masada”), lent to the army to infiltrate demonstrations and make them violent. And yet – most Israelis would not believe this story. Now, seven years later, the IPS admits that its combatants threw stones at soldiers. A commander in the Metzada unit admitted as much in a political trial against Hadash (the Democratic Front for Peace and Equality – Communist Party of Israel) Chairman, MK Mohammed Barakeh. MK Barakeh, who attended the demonstration, is charged with assault against a Border Police officer at the scene, apparently as an attempt to de-arrest a local activist captured by the undercover agents. During his testimony the commander told the court that his subordinates had thrown stones “in the general direction” of soldiers. 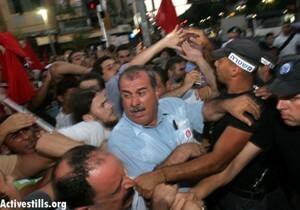 He and other unit members also repeated the claim that they saw Barakeh strangling a policeman. The trial is only taking place now since Members of Knesset can only be prosecuted after a long procedure that requires special permission from a Knesset committee. 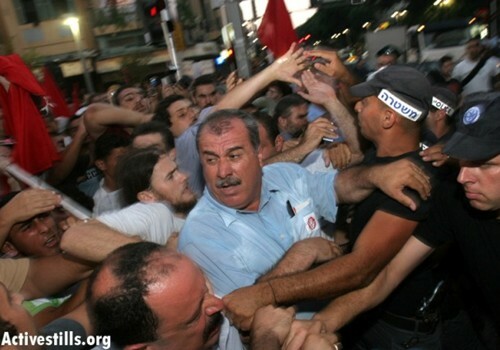 MK Barakeh is also charged with assault against another policeman in a Tel Aviv demonstration during the Second War on Lebanon in 2006. May 8, 2012 in Political affairs.